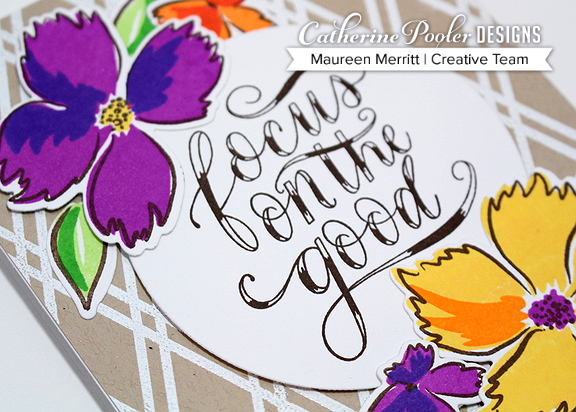 Welcome to Day 1 of the Wild & Wonderful release blog hops for Catherine Pooler Designs. Today new stamps, dies, and ink hit the store. The Creative Team will be sharing projects introducing you to the new products over the next few days. You can see all of the new products here. The new Limoncello and Grape Crush inks are an amazing addition to the Party Collection. They look beautiful stamped with the Wonderful Wildflower stamps. They pop beautifully off of the Sand Dunes background that was heat embossed with BFF Background stamp. The sentiment, stamped in Icing on the Cake, makes the perfect focal point on any card design. Talk about a show stopper. 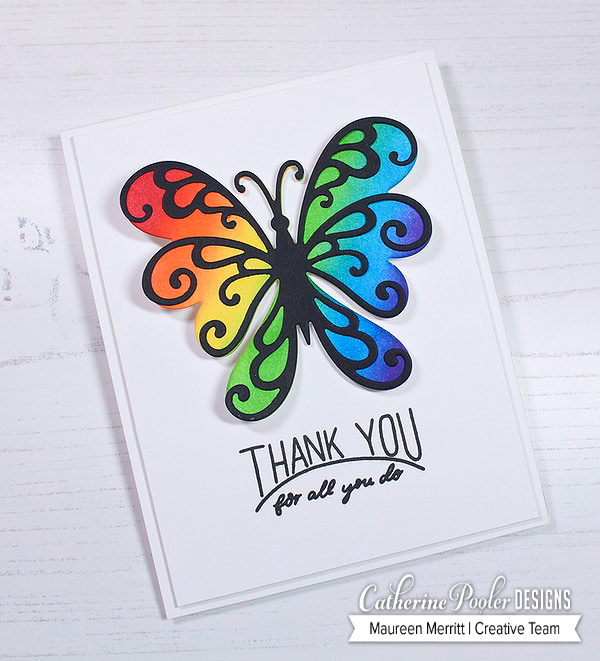 The combination of the In Flight & Scroll Butterfly dies make CAS card making a dream come true! To make this card, I started by die cutting and sponging the In Flight Butterfly. Next, I die cut the Scroll Butterfly with black card stock. I layered the two together and added them to a white card panel and stamped the sentiment from the A Note of Thanks stamp set and adhered it to a white card base. Time to hop along now! Catherine is giving away goodies to 5 lucky commenters, so make sure that you leave comments on all of the blogs along the way. I hope that you've enjoyed my projects today. I'll be back soon with more from the Wild & Wonderful release. Love the bright florals and who can resist a rainbow butterfly! So pretty Maureen! especially white on kraft. A favorite for me. WOW to both cards! the butterfly is the showstopper though, you are so right about layering them and having the rainbow colors is just gorgeous! I'm seeing a lot of Cas cards in my future! I'm loving the bright colors and haven't seen a thing that I don't like...waiting for that postman! Great cards as always! Love the butterfly and the first is beautiful! They are both absolutely beautiful!! I love these cards! Some ideas to CASE for sure!! Oh my goodness...wonderful, cheerful cards. Thank you. Your rainbow butterfly makes me smile - the blending is perfect! Lovely Cards and I just ordered some of the new products. The colors of ink you chose for the butterfly---WOWZERS!! So pretty! Beautiful cards. i love how that butterfly looks like stained glass. And those flowers! BFF background stamp on the first reminds of a trellis in a garden. The card takes me right into a garden. Thanks for sharing. These cards are beautiful....love your color choices. I don't know which card I like better, both so pretty! Both cards are beautiful. The flowers pop on that background stamp. I just love how you did the butterfly on the second card. I can't wait to CASE both of these cards! Thank you for sharing! Your flowers are so lovely and the butterfly is gorgeous! Gorgeous and wonderfully vibrant cards! Sure to bring a smile. Great cards. Love those butterfly dies. Beautiful use of the layering flower stamps. Love the rainbow butterfly!! So pretty!! Great cards, it's making it hard to decide what I "need". Love looking at all of your examples! Thanks! The butterfly is so pretty! lOVE HOW THAT bff BACKGROUND LOOKS LIKE A TRELLIS FOR THOSE FLOWERS TO CLIMB UP. gorgeous. I can't wait to get that butterfly! Love this butterfly. I am going to have to have. Your cards are lovely. Those colours are SO vibrant! Beautiful! ! Both of your cards are beautiful! Thank you so much for taking the time to be here for this wonderful blog hop. thanks so much for sharing your talent! 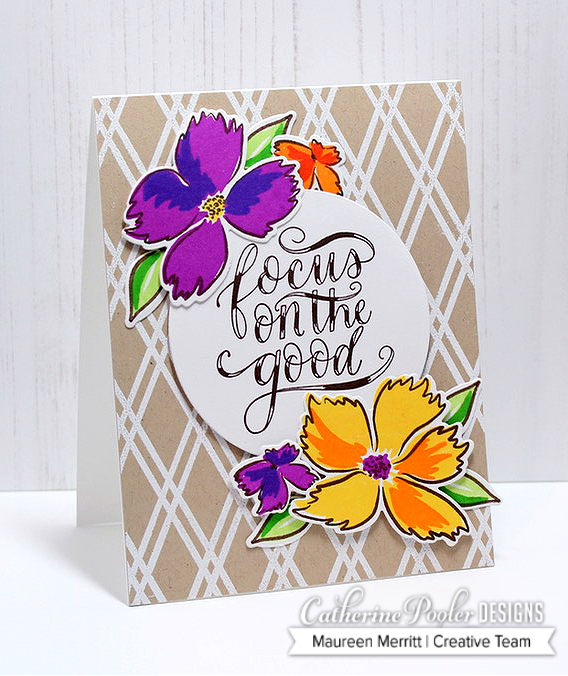 Love your use of the new inks on the wildflowers and sand dune card stock. Your rainbow butterfly is simply lovely! Great cards. The Wonderful Wildflower set and BFF background are pair made in heaven! Another BFF background and I had talked myself out of getting it. Fantastic use of color. I love the background on the Sand Dune paper and yes it really does make the colors POP. Love the rainbow butterfly. Great card! Now that is what I call a beautiful rainbow of colors! The flowers are gorgeous! And I really like the usage of black to the cards it just really makes them pop even more!! OMG - all I can say is WOW!! I love that Butterfly Thank You card. I just might have to buy both of those dies so I can make cards like this. Love your cards! The BFF background stamp on the Sand Dunes paper is very eye catching! I must try that! Thanks for the inspiration! Great color combinations. Fun and happy cards! Terrific color combinations. The two new ink colors are great additions to the CP line. Your cards are bright and beautiful...very "happy". Loving all of the new release. Awesome cards! Love the bright colors on both cards! CP inks are awesome! Great colors used on your cards and the designs are fabulous as always. I think the butterfly card is my favorite. 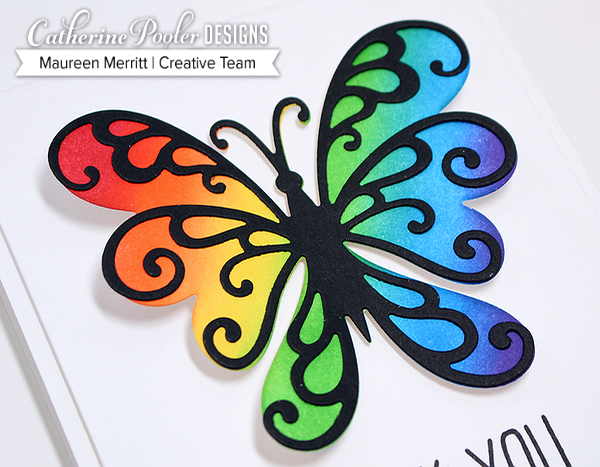 Love the vibrant colors against the black butterfly die. Both cards are stunning! Loooove those bright happy flowers against the Kraft ! The butterfly card is wonderful also. Love the design! Lovely cards,thanks for the chance to win. Wow! Your cards are totally gorgeous!!! Gorgeous cards but I am loving the rainbow butterfly....the black just takes the card to another level! Who doesn't love a good rainbow! These cards are so pretty! Love the new colors.. Really great background stamps! Beautiful card designs! Love the rainbow! Love the craft cardstock background. Makes everything else stand out! Love the bold, bright butterfly. I like the colorful flowers and butterfly and the background on the first one. Your color combos on the flowers are just yummy! Love the cards! Fantastic cards. I love that background on the kraft paper! The butterfly card is a real eye catcher with those beautiful colors!. I love both of these cards! What a great release! Thanks so much for sharing your creativity and talent with us. Love that rainbow butterfly! So uplifting! Gorgeous cards. Love the butterfly! Love that butterfly card..utterly simple but stunning. And the wildflowers just jump off the page. Wow Maureen! Stunning cards! Absolutely terrific :) Thanks! Again...the butterfly is my fav!!! Great color combos on your beautiful cards! Love the pretty flowers and the butterfly! Beautiful cards! This is a wonderful release. Every single thing. Thanks for inspiring me to shop, haha. You’ve made two fantastic cards !! that butterfly always steals the show. first card. such pretty colors. I don't think you've ever made a card that I didn't like Maureen. These are gorgeous!! Maureen that butterfly is simply gorgeous. So colorful, these are beautiful! I love the ink colors. Thanks for sharing with us!! Beautiful cards. I love this new release.